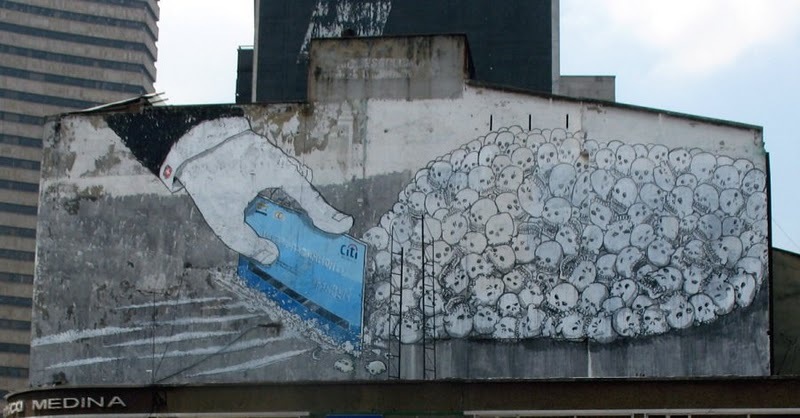 Italian artist Blu recently painted this extraordinary piece on a rooftop in central Bogotá. A besuited white hand reaches out to chop out lines of “cocaine” from a pile of white…skulls. The image could be reproduced and plastered across bars and nightclubs in Europe and the USA. This is not an admonition on the rights and wrongs of drug use, but a reminder that the cocaine industry weakens democracy and fuels violence and corruption, not least in rural Colombia, where the skulls have been piling up for many years. Think before you buy before you chop before you sniff. The Two Escobars is the latest film by our friends at All Rise, the company that produced prizewinning Favela Rising, the story of Anderson Sá, the vocalist of AfroReggae. Jeff Zimbalist and his brother Michael have hit a prize-winning formula again with this film that tells the story of two Escobars, both from Medellin and who both met bloody deaths within months of each other The one story, that of Pablo, has been told many times, as the name of the drug kingpin and billionaire has become folklore. Andrés, the Colombian team captain who was shot dead within weeks of scoring an own goal that sealed his team’s early departure from the 1994 World Cup is a less well known figure. The fates of both men are unraveled to reveal the how Pablo and his millions created the phenomenon known as “narco-soccer”. The film will be showing on ESPN in the USA on June 22nd and is screening at the LA film festival this weekend. It is notching up 5 star reviews at a breakneck rate and is described by Variety as a “knockout” and “riveting pic”. Unmissable! In London is a place that has the mysterious name of Meanwhile 2. 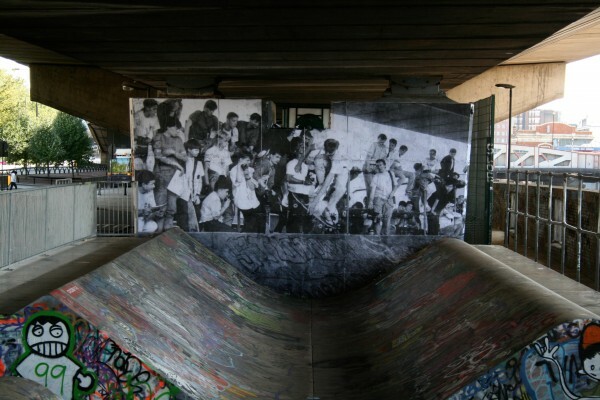 It is a concrete ditch and skatepark that has been skated by Londoners and visitors since it was created at the end of the 1970s. 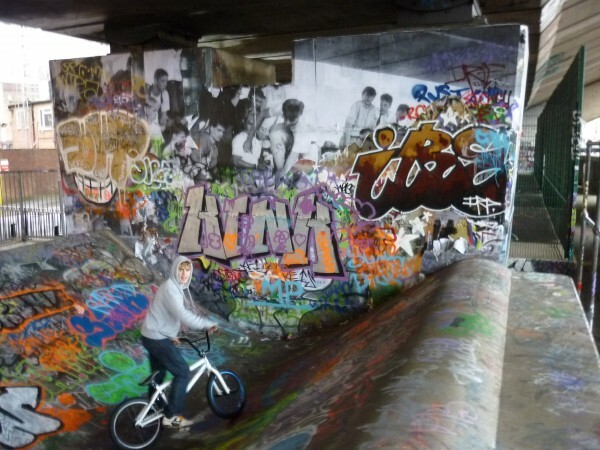 Tucked away under the underbelly of an overhead motorway and looking over a central railway link into West London, this graffiti strewn playground is a far cry from the sanitised modern pay-to-skate Playstation park up the road. During the 1980s Meanwhile 2 was where indie skate heads and inner city urban youth confraternised and fought under the rumble of the traffic overhead and the whistle and roar of the trains alongside. Pioneer west London graffiti writers such as Cazbee and Foam passed by, while the authors of fanzines such as Skate Muties from the 5th Dimension (from Bristol) and members of pioneer UK skate band The Stupids from Ipswich ate chips and fell off their boards. 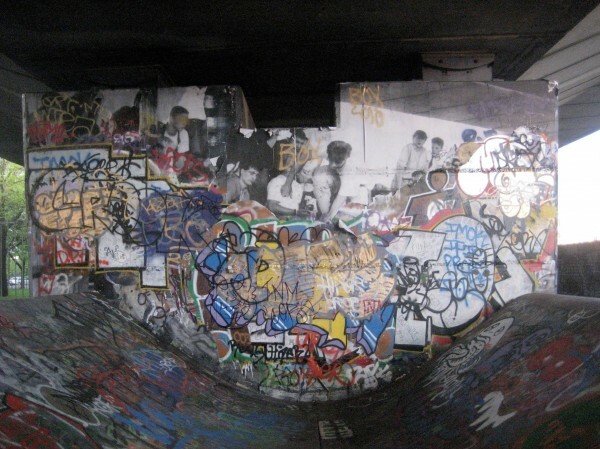 In the middle of all this a UK based American called Steve Wiltshire put on competitions called The Smell of Death, events that united the various tribes under the banner of skateboarding, beer and a punk soundtrack that was not to everyone’s taste. 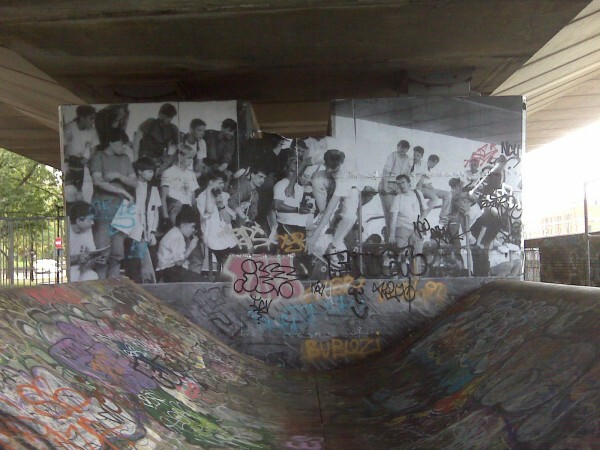 In September 2009 a photograph of a Smell of Death competition from 1986, covering an entire pillar of the Westway, mysteriously appeared at Meanwhile 2.